Well the rain has come back with a vengeance, but I'm not bothered I will have tucked into this warming bowl of Watermelon Curry studded with black beans and paneer. After enjoying Celia's Rhubarb and Lentil Curry last year, and the Pineapple Curry more recently, I was not at all put off by the idea of an exotic fruit in Curry. This is a South Asian recipe originally from Rajastan, India. A version of it was popularised in Camellia Panjabi's 50 Great Curries of India. You will also find variations of this Watermelon Curry on blogosphere, especially on blogs based in the South Indian Subcontinent. There is also a Watermelon Curry by Roopa Gulati. There was a time when the only South Asian female cook you would see on British TV was Madhur Jaffrey, but now there are a whole host of South Asian cooks showcasing their culinary twists on South Asian cuisine. For me personally, Roopa Gulati was one of the first South Asian food writers to fuse British and South Asian flavours and this was greatly encouraging for someone like me doing it at home. For example, she created a spiced version of Shepherds or Cottage Pie, Roast Potatoes with Chilli, Cumin Carrots and Yorkshire Puddings via the Punjab. Oh I digress, but before I return to the 'Watermelon, Paneer and Black Bean Curry' - Did you know that you can actually use the rind from the watermelon too. There is a Pakistani recipe called Tarbuz Ka Cheelka Salan (Watermelon Rind curry) that does exactly that. Its a very frugal recipe, but I didin't fancy another curry. Instead I made other plans for the rind. I was going to pickle the watermelon rind, except when I turned around my Darling husband in his haste to clean up after me, had already disposed of them. You would think the addition of the watermelon to a curry would make the dish sweet, but you would be completely wrong. There is a sweetness, but it is balanced wonderfully with the spices. The lightly spiced sauce is red not from tomatoes or the spices, but from blended watermelon chunks. 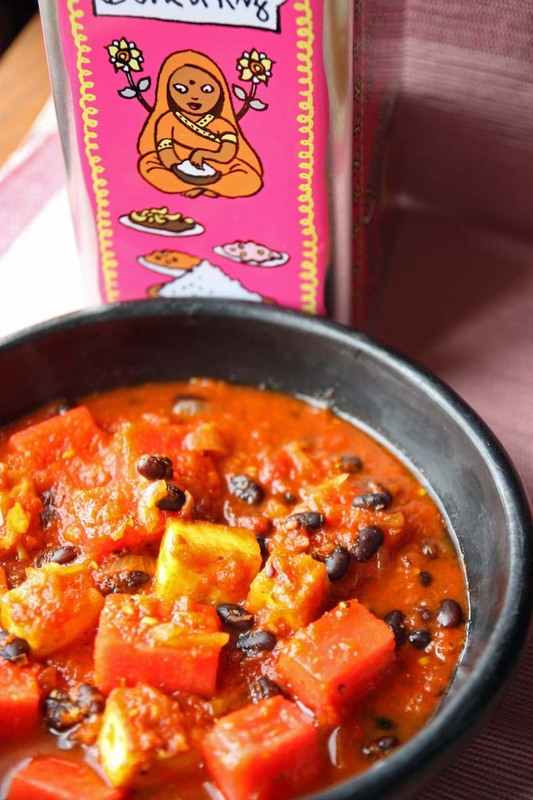 The black beans and paneer add colour, but also soft and chewy textures. When you bite into a watermelon chunk, the juices are released and slowly run down the back of your throat. The sensation is amazing as it's sweet-spicy and cooling. The flavours certainly do linger on your tongue. We have so much left over, that I think am going to make some roti's aka chapatti tomorrow (and if I'm lazy a tortilla wrap will do), and then roll it up like a cone to cup the filling, but today it was simply enjoyed with Basmati rice. 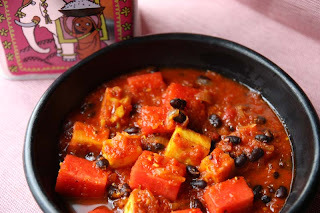 To encourage you to try this recipe, I can describe it to you as a variation of a Vegetarian Chilli Bean, but in place of the potatoes, pumpkin or sweet potato, there are chunks of watermelon. This recipe can easily be veganized too, but substituting the paneer with tofu. Cook the black beans according to packet instructions until tender, drain and set aside. In a food processor, blend all but 500g of the watermelon. Dice the remaining watermelon and set aside. Heat 1 tablespoon of the oil in a frying pan and when hot, gently cook the onions, ginger and garlic until soft. Add the spices and cook for a further minute, or until fragrant. Then pour in the liquidised watermelon juice, bring to the boil, and then simmer until reduced by half. (If you have cooked the black beans from scratch and I had, then add them at this stage). While the watermelon sauce is thickening, heat the remaining oil in a frying pan, and add the paneer and fry over medium heat until golden on all sides. Remove with a slotted spoon. 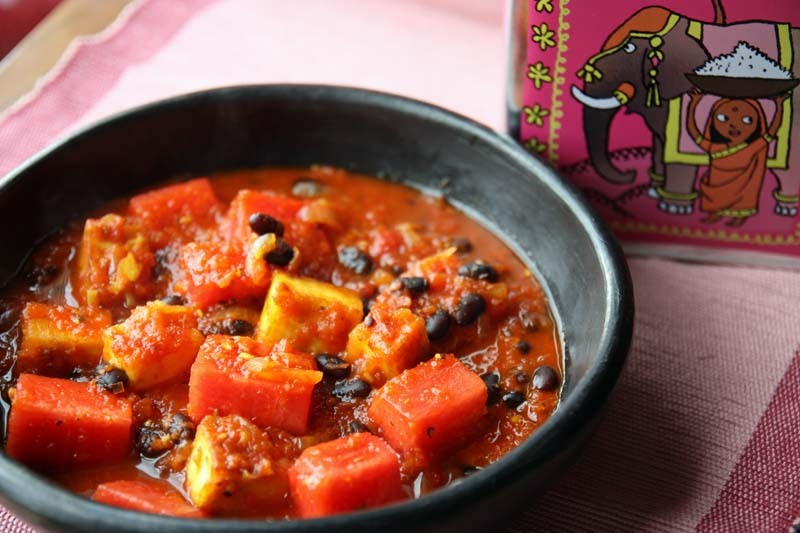 Once the curry has reduced, stir in the beans, the paneer and the diced watermelon to the curry and gently heat through. Season with salt and serve immediately. Adapted from Maria Elia Modern Vegetarian. Her original version of Watermelon curry had been made a with seafood. wow, this is so neat! great recipe. this is a first for me (incorporating watermelons in dishes), and am loving it! would love to try this at home! Thank you so much for sharing on Momtrends. I love checking out all the Friday Food submissions. This was one of the more exotic submissions. I admit to only braving the "standard" curries, thanks for the inspiration. Have a great weekend and thanks for sharing. this has got to be one of the most interesting Indian recipes I've ever come across! I never used to be open to fruit curries, but after experimenting with mango and pineapple a little I think I'm ready to move a little further even..
Only recently found your blog... the recipes are inspirational, colourful and mouthwatering. I grow organically and forage too but wish there were more than just me to cook for... Great blog! A very interesting curry for sure! The colour is truly beautiful. Oh my gosh this sounds incredible! You have described it so wonderfully. You have a lot left?! Please post me some! What a stunning set of textures and flavours... I am drooling! I really recommend the combo. Thank you so much Maiylah. Its my first tiem participating in Food Friday, I look forward to being part of it more in the future. Its my first time partipating in Momtrends, I look forward to sharing more. Fruit in curry style dishes is new to me too. I'd encourage you to try it for sure. I like the sound of the mango and pineapple curry, may be on the menu soon. Thank you so, so much Greenorchid for your lovely compliment. I can't tell you how much it means to me - Thank you. I know what you mean about there being more people to feed. In our home there is just myself and my husband and i always make far too much that it tnds to last us for days, we are hoping to move closer to family so that should be addressed. Hope you find yourself in good company to do the same too! I've never heard of using watermelon rind for anything, so neat. This looks yummy! How interesting to add watermelon to this curry. We have seen a lot of rain here in Seattle too. A warm curry would be very inviting! Please do try it, I think you'll like it. I hope Seattle sees the sunshine soon, I know we so need it in Scotland. This has been the worst summer in a long time, and that not my opinion - a lot of the Scots are ackowledging this too. Hey there, Thank a lot for your comment, I think I´ll have to write my blog in english too. Thank you so much for your visit and kind comments.